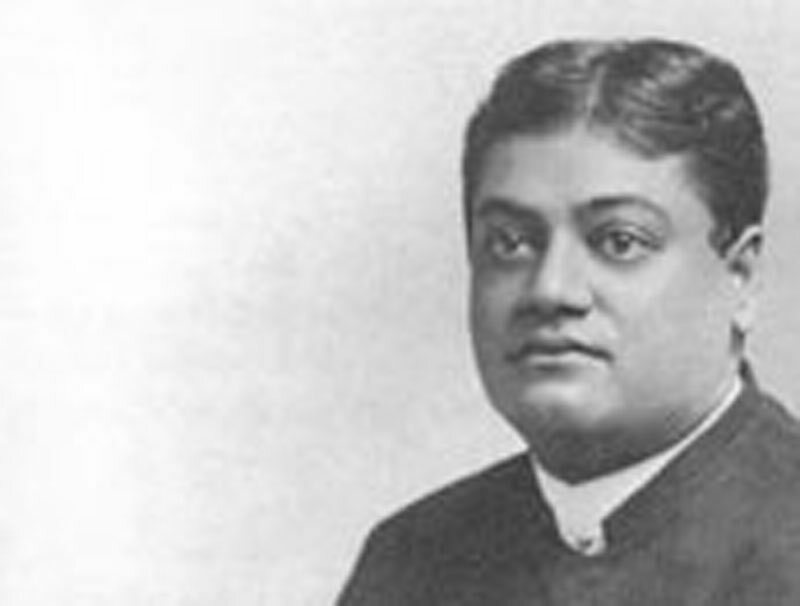 EARLY in March 1900 the Swami Vivekananda gave a series of three lectures on "Indian Ideals" in Redmen's Hall, Union Square, San Francisco, and it was at the first lecture of this series that I had the blessed privilege of hearing him. Being in ill health, both mentally and physically, it was a great effort to go to the lecture; and as I sat in the hall waiting for the Swami to come. I began to wonder whether I had not made a mistake in coming to hear him; but all doubts vanished when the Swami's majestic figure entered the hall. He talked for about two hours telling us of India's Ideals and taking us with him, as it were, to his own country so that we might understand him a little and be able to comprehend even in the least the great truths he taught. After the lecture, I was introduced to the Swami; but feeling overawed by his wonderful presence. I did not speak, but sat down at a distance and watched him, while waiting for friends who were busy settling up the business connected with the lectures. After the second lecture, I was again waiting, sitting at a distance watching the Swami, when he looked across and beckoned to me to come to him. I went and stood before him as he sat in a chair. He said, "Madame. if you want to see me privately, you come to the flat on Turk Street, no charge there, none of this botheration about money." I told him I should like very much to see him. He said, "Come tomorrow morning", and I thanked him. Much of the night was spent thinking of all the questions I should ask him, as many questions had been troubling me for months and no one to whom I had gone was able to help me. On arriving at the flat next morning, I was told that the Swami was going out, so could not see any one. I said I knew he would see me because he had told me I might come, so I was allowed to go up the stairs and into the front sitting-room. In a little while the Swami came into me room, dressed in his long overcoat and little round hat, chanting softly. He sat on a chair on the opposite side of the room and continued chanting softly in his incomparable way. Presently he said "Well, Madame!" I could not speak but began to weep and kept on weeping as though the flood-gates had been opened. The Swami continued chanting for a while, then said, "Come tomorrow about the same time." Thus ended my first interview with the Blessed Swami Vivekananda, and as I went from his presence, my problems were solved and my questions were answered, though he had not asked me anything. It is now over twenty-four years since that interview with the Swami, yet it stands out in memory as the greatest blessing of my life. I had the wonderful privilege of seeing Swamiji every day for a month, and was in the meditation class which he held in Turk Street. I used to stay after the class and help him cook lunch etc., or rather, he allowed me to be in the kitchen with him and do odd jobs for him while he talked Vedanta and chanted and cooked. One verse from the Gita he chanted a great deal is verse 61, Chapter 18: "The Lord dwelleth in the hearts of all beings, O Arjuna, by His illusive power, causing all beings to revolve as though mounted on a potter's wheel. He chanted it in Sanskrit, and every now and then would stop and talk of it. He was so wonderful, his nature so manysided, at times so childlike, at times the Vedanta Lion, but to me always the kind and loving parent. He told me not to call him Swami, but to call him "Babaji", as the children did in India. Once when walking along the street with Swamiji after a lecture, all at once he seemed to me so big, as though he towered above the ordinary mortals. The people on the street looked like pigmies, and he had such a majestic presence that people stepped aside to let him pass by. One evening after the lecture, Swamiji insisted upon taking a party of about 10 or 12 of us to have ice-cream. Some ordered ice-cream and some ice-cream soda. Swamiji was fond of ice-cream but did not care for ice-cream soda. The waitress who look the order made a mistake and brought ice-cream soda for the Swami; she said she would change it for him. The proprietor spoke to the waitress about it, and when Swamiji heard him, he called out, "Don't you scold that poor girl. I'll take all the ice-cream soda if you are going to scold her." After living in Turk Street for a month, Swamiji went to Alameda and stayed at the "Home of Truth", It was quite a large house and was surrounded by a beautiful garden, where the Swamiji used to walk about in smoking. There was quite a large porch on the house on which Swamiji sat sometimes talking to the few of us who gathered around him. The Easter Sunday night was the full moon, the nisteria was in full bloom and draped the porch like a curtain. Swamiji sat on the porch smoking and telling funny stories, then he told of how his feet hurt him when he wore shoes in Chicago, and of his experience with a lady doctor who had undertaken to doctor his toe. He said. "Oh my toe, my toe! Whenever I think of that lady doctor, my toe hurts. "Then one of the party asked him to talk on "Renunciation". "Renunciation?" said Swamiji, "Babies, what do you know of renunciation?" "Are we too young even to hear of it?" was asked. Swamiji was silent for a while and then gave a most illuminating and inspiring talk. He spoke of discipleship and of entire resignation to the guru, which was quite a new teaching to the Western world. While in Alameda Swamiji used to cook Hindu dishes for himself on Sunday afternoons, and I again had the privilege of being with him and partaking of his dishes; and although I attended all Swamiji's public lectures both in San Francisco and Alameda, it was this close contact with the Swamiji that I most deeply cherish. Once after being quiet for some time Swamiji said, "Madame, be broad-minded, always see two ways. When I am on the Heights I say 'I am He', and when I have a stomach-ache, I say "Mother, have mercy on me'. Always see two ways." On another occasion he said, "Learn to be the witness. If there are two dogs fighting on the street and I go out there, I get mixed up in the fight but if I stay quietly in my room. I witness the fight from the window. So learn to be the witness." While in Alameda Swamiji gave public lectures in Tucker Hall. He gave one wonderful lecture. "The Ultimate Destiny of Man" and Finished by placing his hand on his chest and saying "I am God". A most awed silence fell upon the audience, and many people thought it blasphemy for Swamiji to say such a thing. Once he did something in rather an unconventional way. and I was a little shocked at him. He said. "O Madame, you always want this little outside to be so nice. It is not the outside that matters, it is the inside." How little we understood the Swamiji? We had no knowledge of what he really was. Sometimes he would tell me things, and I in the abundance of my ignorance, would tell him I did not think that way, and he would laugh and say, "Don't you?" His love and toleration was wonderful. Swamiji was not in good health — much lecturing told upon him. He used to say he did not like platform work, "Public lecturing is killing. At eight o'clock I am to speak on'Love'. At eight o'clock I do not feel like love!" After he finished lecturing in Alameda, the Swami went to Camp Taylor and a tittle later started for the East and we in California never saw him again. Yet we who were blessed by his presence cannot feel he is entirely gone from us. He lives in our memories and in the teachings he gave us. Before he left, he told me if I ever got into psychic difficulty again to call on him and he would hear me wherever he was, even though hundreds of miles away, and it may be he can hear even now.